This card cannot be Normal Summoned or Set. This card cannot be Special Summoned except with its own effect or with "Assault Mode Activate". You can Tribute this card to negate the activation of a Spell Card, Trap Card, or Effect Monster's effect, and destroy that card. If you negate an effect this way, you can Special Summon this card from your Graveyard during the End Phase. When this card on the field is destroyed, you can Special Summon 1 "Stardust Dragon" from your Graveyard. This monster appears in the artwork of Assault Revival. As with many /Assault Mode monsters, this card's effect is a more powerful version of its base form (in this card's case, Stardust Dragon). This is one of few promotional cards that is released as two different rarities in the same Set number. This card is in the same pose as the second OCG/TCG artwork of Blue-Eyes White Dragon. Coincidentally, this card has the same ATK and DEF as Blue-Eyes White Dragon. 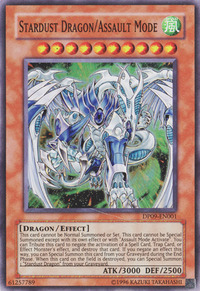 Stardust Dragon/Assault Mode is the only /Assault Mode monster that was shown in a Yu-Gi-Oh! 5D's episode preview. The effect which negates the activation of an effect does not target. If "Stardust Dragon" or "Stardust Dragon/Assault Mode" does not negate the effect of a Spell/Trap/Effect monster, during the End Phase it cannot Special Summon itself. For example, if "Divine Wrath" negates the effect of "Stardust Dragon" or "Stardust Dragon/Assault Mode", then you cannot activate the effect during the End Phase. : When "Stardust Dragon/Assault Mode" does not negate the activation of the effect of a card, can it Special Summon itself during the End Phase?